As the sun-filled days steadily get shorter and shorter here in the northeastern part of the United States, and the morning and evening air begins to shiver a bit, I have mentally packed away my Summer sewing and am switching over to my favorite season of all – Autumn. As much as I love this time of year, I find that my wardrobe generally is sparse for Fall apparel. Last year, I made a Diane von Furstenberg knock-off wrap dress that was – and still is, of course – perfect for Fall. So it should come to no one’s surprise that I want to add one or two more Fall-appropriate dresses this year. I have just begun work on the muslin for a silk dress, using a Vogue pattern from the 1980s (which is somewhat of a shock, since I consider that decade, for the most part, a vast fashion desert!) 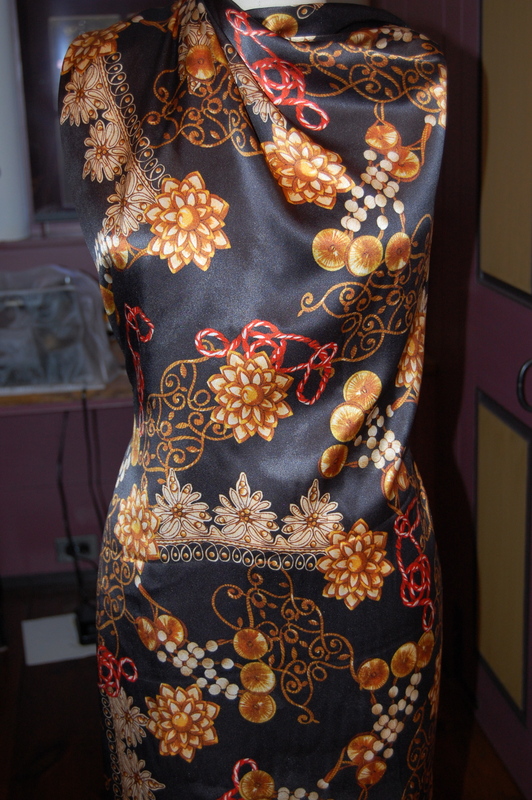 The silk is Italian, purchased from Mendel Goldberg in New York City. This dress should be ideal for Autumn, assuming I finish it before we’ve moved into Winter! Fabric for my current project. Second, I love to tell a story. I’m not sure how it happens, but it often seems that my sewing projects have inherent stories to them. Sometimes it’s about the pattern, sometimes it’s about the fabric, sometimes it’s about a long-fulfilled sewing dream of mine (left over from the ‘50s, ‘60s or ‘70s! ), sometimes it’s about the accessories, and sometimes it’s a combination of all of these things. Writing and telling stories about my sewing helps to give it another layer of meaning. Third, writing and sewing are very, very similar. Both involve great expanses of solitary endeavor, engineering (of words or patterns and cloth), creativity, sense of style, striving for excellence of technique, and tenacity. However, both have a friendly and supportive communal aspect to them as well, when shared with others of the same interest. And – both sewing and writing are goal-oriented pursuits, perfect for my personality type! Finally, I must give credit to my daughter, Susanna, who gave me the inspiration to start a sewing blog. An exceptional writer, Susanna had her own blog for a while, and her encouragement to me made all the difference. Answering this question reminds me of the beginning sentence of Tolstoy’s Anna Karenina: “All happy families are alike; each unhappy family is unhappy in its own way.” Except that there is nothing unhappy about sewing blogs! I think my interest in the fashions and vintage patterns of the ‘50s, ‘60s, and ‘70s helps to differentiate my blog from many others. I really enjoy making connections between mid-century fashions and the fashions of today. The fact that I can make a dress using a 50-year-old pattern (or 50-year-old fabric!) and have it look totally current continues to amaze me – and sharing this excitement hopefully makes my blog just a little bit unique. I wish I had a magic formula to share! Fortunately, sewing is a slow process, at least for me, so I have lots of time to think about writing while I stitch away. I sometimes make notes to myself (and take photos, of course) while sewing and sometimes I wish I had made notes and taken more photos! I usually try to do a little research on the pattern (or fabric) I am using, to help “tell the story”. I actually often start with a title for my post, which can sometimes take a lot of thought and time. That small detail usually sets the narrative for me, so that I am able to proceed with the story. One thing I try to do is keep my posts to a reasonable length (a guideline I am not following right now…). Because of this, I do a lot of editing during and after the writing process. Now comes the fun part – and difficult part, too. Fun because I can nominate two fellow sewing bloggers to participate in this same survey, and difficult because there are so many interesting and talented bloggers about whom I would love to learn more. However, two talented dressmakers whose blog posts I never want to miss are my nominees: Janene of ooobop and Brooke of Custom Style. Of course, you, Janene and Brooke, are under no obligation to participate, but I do hope you will accept the “mission”! Aww thanks for the nomination! I’ve actually been pondering the details of a post of another blogging “game” that’s going around and I think combining it with this would work really well. Thanks, Brooke! I obviously love having you as a reader and blogging friend!! Great to learn more about you! What a wonderful dress! Oh, thank you! So good to hear from you. I am just trying to pick up pieces together… step by step. Seeing all of you making gorgeous creations is making me feeling much better. So happy that you took this challenge, Karen. Your blog is one I always looks forward to. I love a story! Thank you, Cissie. It’s good to know my stories aren’t putting people to sleep! creating something fabulous out of them. And…. the best part is that it always turns out stunning and flattering! Thank you for sharing with us. I really laughed when I read your comment. I actually WAS born in the South (North Carolina) – and raised there, too. However, both my parents were from Pennsylvania so I had kind of a hybrid upbringing! I’d love to think that my penchant for storytelling has its roots in my place of birth! Thank you so much for this lovely comment and for reading my blog! Is a wonderful. Fabric store. Sorry for punctuation errors trying to learn to use an ipad. Am responding to your comment below — I was born in Asheville and lived there for 10 years before we moved to Raleigh. I consider Asheville my home (at least my NC home; Pennsylvania is really my home!). I do not have much of an accent, according to those who know me, but some people I meet pick up a southern “lilt” in my speech. Good luck with your ipad – it takes some practice to get used to the word processing part of it! One of my classmates from a Susan Khalje class I took always takes an annual class with Sandra Betzina – and says she is a great teacher! The silk print from Mendel Goldberg is fabulous. I can’t wait to see it made up. I checked out the two blogs you mentioned and they are great. Your stories are always fascinating. Thanks so much, Mary. I’m excited about the silk from M. Goldberg – I don’t think the photo does it justice! So glad you accepted your mission! I enjoy your blog and its lovely to know a little more about the back story. Many thanks! We sure do have a good time with our sewing and blogging, don’t we?! Oh, so happy to hear from you, Janene – and delighted that you will expound on your writing process. Hope those tech issues are resolved – is there anything more frustrating when all you want to do is sew and write about it?